As school leaders across the country analyze last year’s standardized test results, I expect that many are paying specific attention to how their schools are addressing disparities in educational outcomes for students of color. These disparities — known as the opportunity gap — are the product of a complex web of structural racism that intertwines systemic biases in areas such as housing, health care, criminal justice, media, government, and most certainly education. This complexity precludes any silver-bullet solution to the opportunity gap. But if education leaders are serious about solving this problem, they should start by addressing the diversity gap that exists at every level of our education system’s leadership. According to the National Center for Education Statistics, only 20 percent of public school teachers identify as people of color, despite the fact that over 50 percent of our nation’s public school children identify as such. This means that many students of color lack teachers who share their racial and cultural backgrounds. Such exposure is inherently important for every child, but research specifically confirms that when black students have at least one black teacher, they perform better on standardized tests, are more likely to graduate from high school, and are more likely to aspire to attend a four-year college. But the diversity gap doesn’t end with classroom teachers. In fact, as you move up our education system’s hierarchy, it actually worsens. Only 20 percent of our nation’s public school principals identify as people of color, a percentage that has improved a mere 7 percentage points over the past 30 years. Our school districts’ superintendents? Only 8.1 percent of them identify as people of color. Perhaps this lack of diversity is the reason that every decade since the publication of A Nation at Risk has echoed rebranded national wake-up calls to address the opportunity gap. Initiatives like Goals 2000, No Child Left Behind, and Race to the Top all have proposed similar solutions to systemic problems that have existed in our country for generations. As a white male from a middle-class family with access to strong public schools, I admit that it took my own wake-up call as a teacher in St. Louis Public Schools to help me realize the undue privilege of my own educational experience and the inequities of our system. But people of color don’t have the luxury of waiting for wake-up calls. They can’t close their eyes to systemic inequity when inequity defines their daily lived experience. That’s why addressing the opportunity gap must begin with confronting the diversity gap. By empowering more people of color to be the decision-makers in our classrooms, schools, and school systems, we can begin to unweave the complex web of systemic racism one decision at a time. In the classroom, more teachers of color can help our schools introduce culturally responsive curricula that affirm the identity of every student. At the school level, more leaders of color can help implement restorative discipline practices and ensure that all students have access to advanced, college prep courses. And at the systems level, more superintendents of color can determine policies for funding, teacher placement, and school assignment that ensure that every student has equitable access to a high-quality education. Several education organizations across the country are already laser-focused on addressing our education system’s crippling lack of diversity. 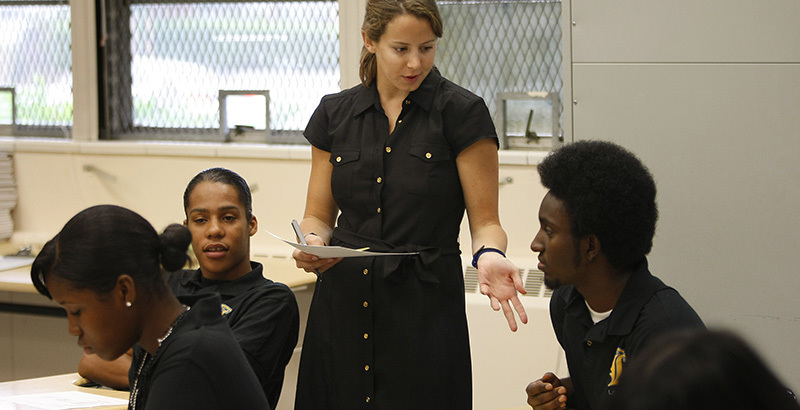 Uncommon Schools, one of the country’s highest-performing charter school networks, is awarding summer fellowships to underrepresented college juniors with the goal of hiring them as teachers after they graduate. Already, the program has helped Uncommon more than double the national average for the percentage of teachers who identify as people of color. While most of our nation’s schools of education sadly perpetuate the lack of diversity in our current teaching force, Relay Graduate School of Education turns the status quo on its head; nearly 75 percent of last year’s teacher residents identified as people of color. At The Mind Trust in Indianapolis, we run a competitive fellowship that gives top school leaders one or two full years of planning time and support as they work to launch high-quality schools in partnership with our local district. Over 60 percent of the school leaders who have won this fellowship — and 100 percent of our most recent cohort — identify as people of color. In turn, we’ve seen these school leaders hire teaching staffs with far greater diversity than comparable schools in Indianapolis have and achieve promising results in their schools’ first years. If we are to make progress closing the opportunity gap, we must recognize that efforts like these are more than strategies for diversifying talent pipelines. They are long-overdue steps toward ensuring that those who are most affected by our country’s history of systemic racism are the ones leading the effort to dismantle it. Brandon Brown is CEO of The Mind Trust, an Indianapolis-based education nonprofit. He previously served as director of charter schools for the Indianapolis Mayor’s Office of Education Innovation. Brandon Brown is CEO of The Mind Trust, an education nonprofit focused on transforming K-12 education in Indianapolis.